Six-year old philanthropist Blake Ansari is a young leader wise beyond his years. After reading about Dasani, and her life as a homeless child in the New York Times, the elementary school student decided he wanted to start a book drive. 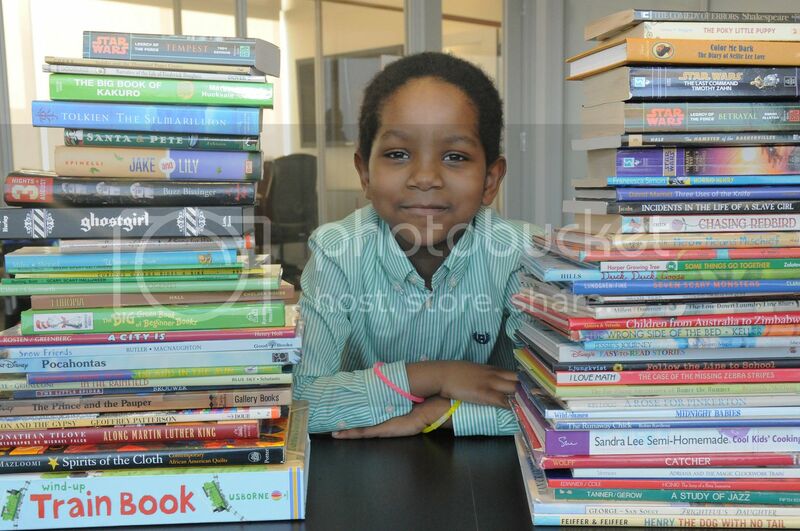 With the support of his parents Nuri and M. Starita Boyce Ansari, Blake began collecting books to donate to homeless children on Valentine’s Day. He started by asking a few of his classmates at Metropolitan Montessori School of New York to join him. Within days, he had collected more than 100 books. Over the next few weeks, he rallied donations from friends and family across the tri-state area including Mr. Robert Gore and City Councilwoman Helen Rosenthal. Ultimately, Blake was able to give more than 600 books to the youth at NYC’s Department of Homeless Services Prevention Assistance & Temporary Housing (PATH). What inspired you to make a donation of books to homeless children? The story in the newspaper about homeless children. They don't have libraries. I want them to read everyday so they can become excellent readers. I want them to go to college and get good jobs. Then they can buy a home and their children will not be homeless. I want them to be happy and build their brains. I want everyone to be safe and happy. I am also concerned about the environment and want the Chinese to stop poaching in Africa. That is why I want to be a veterinarian to save the animals and protect the environment. I have lots of heroes. A few are Nelson Mandela, Steve Biko, Malcolm X, President Obama and First Lady Michelle Obama, Muhammad Ali, Ella Fitzgerald, Dr. Maria Montessori, Rosa Parks, Dr. Mae Jemison, Dr. Mark Dean and many more people. What advice would you give to other young people who want to help their communities? When you listen to your community, learn from your community and help your community you connect to your best self. An inspiring story! Says a lot about the young man as well as his parents and others in his life. Yes, thank you Cynthia and kudos to you Starita! Tracey, I both appreciate and celebrate all you do!!! Thank you for all that you are doing to help the kids in your City to have a chance to enjoy learning & reading. We have been trying to do the same thing in San Francisco. With the help of a group of 5th graders who are known at school as the Susty Girls (Susty is short for sustainability) and volunteers, we built and gifted a Little Free Library for our community art show. We have been rolling the library, which is built on wheels and stocked with children's books, across the street to the Tenderloin Children's Playground. There the kids who come with their afterschool programs are able to pick out a book to read. If Blake would like to build his own Little Free Library, please let me know. I would be happy to find a way to send you the kit parts created by one of our project volunteers - pre-cut wood that can be put together and decorated by Blake.